I don't get Tag. I like being "it." But I have to immediately go tag somebody? I'd be "it" the whole time. I could only laugh and lean my arm through to the back seat: Give me five, buddy. You're "it," Liam. You're "it." Just came home from the gym. Another notch of my milestones. I was having a great workout during my shoulder routine and managed to get to 140lb shoulder press on the freeweight machine. While I was in Atlanta, I started with 40lbs and could feel the obvious weakness in my lowerback and I used to think I could feel the bones in my right shoulder close to popping out of socket. Two years and one storm later, I've more than trippled that weight. For me, it is an accomplishment. A new height I never thought I could reach. Another inch I've raised my personal bar. Short version: Crappiest piece of crap ever crapped into a crapper. Long version: Some ganked up Hollywood icehead actually believed the comic-reading public would be fond of an "action movie" where the first hour actually contains NO ACTION. Next, the now-utterly-bored viewers we supposed to swallow a ninja-trained, halter-top wearing professional assassin spontaneously developing a soft spot in her heart and having mercy on one of her targets because he's a single father. Then the four comic-junkies left in the audience are treated the most profoundly pussified super-henchmen to ever crap on the Big Screen. And finally, the grand conclusion is a drawn out pansy fest where the villains are they're so easily defeated that Liberace rose from the grave just to laugh at them and offer them pink purses to go with their little pink dresses. With the release of Elektra, an all new level of suckitude has been reached. And a small piece of the universe has died because this flick saw the light of day. I would rather perform an un-sedated vasectomy on myself with a George Foreman grill than see this movie again. Though I think the act of watching the whole thing has already rendered me sterile. A new record today. I was doing my chest routine in the gym and hit 210lbs on the free weight machine. After taking off last week, I decided to see how well rested I was and hit the flat bench. While I was in Atlanta, working out with Kimmer, I could barely do a couple of reps of 130lbs, mostly with his help and a lot of straining. Today, I krept under the bar and banged out three sets of 130lbs. Without anyone spotting me. Without bursting a blood vessel. It's only 130lbs, but it was a celebration for me. Something I'd never been able to do. And today I did it, alone. Jason called. He was excited and they had just finished a visit with the OB/GYN. 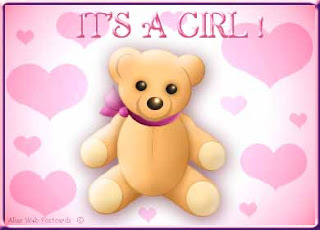 As you can guess: IT'S A GIRL! They're going to name her Morgan A-Something McDougal. I'm sorry, Jay, I can't remember the middle name. I keep thinking about the initials: M.A.M. Cruising to work this morning. Trying to figure what God has in store of us this year. Last night I'm wearing shorts. Today it is 39 degrees. God has jokes. That's what I like about him. And when I go to meet him, I want to ride in a Cadillac. A sweet sweet, quad exhaust, fuel injected death ride like the one I see smoothing in front of me this morning. Black and slick and fine as the hair on a newborn's head. 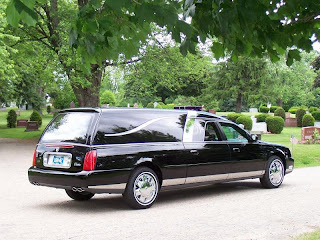 I don't think I've ever wanted to be in a hearse so bad. Pimpus Ex Mortis. Even had some tricked out rims and a stereo I could feel three car-lengths away. That's how I want to go. Blasting some Iron Maiden, rolling in the 2005 Cadillac Deathmobile. And yea though I walk through the valley of Katrina, I shall fear no evil. For it will be a sweet ride in the end. Ever since Beetle Juice, I've been waiting to see Winona's... um... talents. Twenty years worth of patience gets me the cartoon version. Works for me! That alone was worth the price of the rental. It was true to the original story. The graphics were better than promised. The acting and the... um... talents lived up to the hype. Keanu indeed knows kung fu. Robert (Cindy's Dad) and Granny Pam came over today, for dinner. 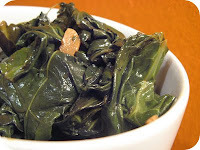 I ate at least five servings of Cindy collard greens that Cindy fixed. They were absolutely the best ones she's ever made. We're talking restaraunt quality stuff here. And a very merry Happy Birthday to my Grandfather. 87 today. Sill kicking like Bruce Lee. Should have shared some collards with him!